Reports surfaced in recent weeks that place unmanageable levels of debt at the heart of an internal proposal to shutter as many as 1,000 Payless stores. Additional details have yet to emerge as to locations that are on the chopping block or the timing of the proposed closures, but the news is not good as another retailer faces the fallout from changing consumer shopping patterns and declining store traffic. Payless boasts roughly 3,400 domestic locations (3,392 stores in the US and Canada according to Chain Store Guide’s Database of Department Stores and Shoe Retailers) and 1,050 stores internationally. A round of closures on such a scale would equate to greater than 20% of the company’s store portfolio. 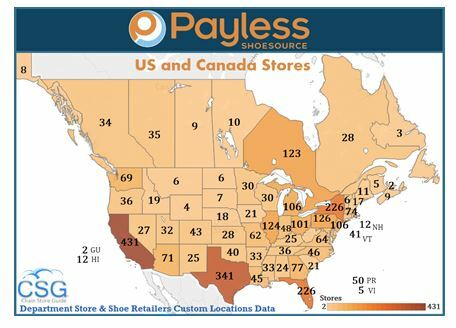 Leveraging store-locations data from our custom-solutions team, we can see the scale of Payless’s current operations on a state-by-state, province-by-province and territory-by-territory basis. Digging deeper, the Chain Store Guide database contains geocoding and addresses for each of these 3,392 locations. And regardless of the ultimate shape of the Payless store-closing plan, our business intelligence and research teams will keep our clients, our customers and our database updated on a store-by-store basis. If your business is in the business of retail locations, Chain Store Guide is here to deliver the results you need. Give us a call.